In the last few weeks, almost all Occupy encampments have been cleared across the United States. Despite that, the movement is continuing to gain broader support. Occupy 2.0 is in the making! 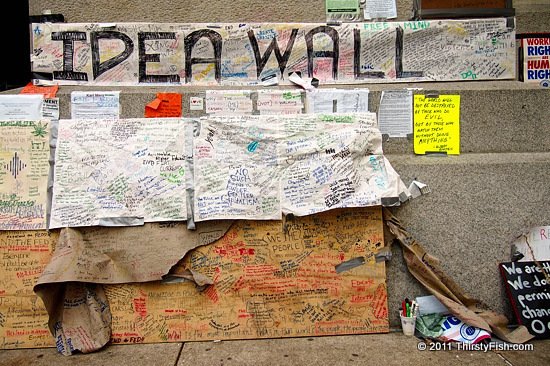 The Occupy Movement has been criticized by politicians and the media for not posting clear goals. As always, the so called mainstream media pundits as well as self-appointed experts representing every "-ism" have taken it upon themselves to fill in the blanks. This resistance to post clear goals and avoiding being "defined" has actually nourished the movement. It is my understanding that, the movement has been empowered by three simple principles. The first of these is nonviolence. The second is that it is a leaderless movement. The third is that it's seeking an inclusive global future; not one at the expense of people in other parts of the world. Although many have dismissed the Occupy Moment as, idealistic, utopian or even childish, the prospect of these three principles, the power of their combination, has already frightened those who are defending the status quo. What is at stake? In the simplest sense, our future. For a movement like Occupy to succeed, for any movement with such principles to succeed, the movement would have to successfully educate and inform at least a critical number of people, using facts and reason. This is a difficult task in a world where information, and as a result, people are manipulated through mainstream education and mainstream media. It is even more difficult in an already ignorant and apathetic world. On the other hand, the Internet provides the opportunity to overcome some of these problems; it makes information, whether fact or fad, accessible. And once we learn how to overcome the information overload, it is not inconceivable that we can reshape our future. That is why so many Internet censorship bills are being proposed under the disguise of our protection.